Easily among the most popular casual outdoor furniture on the market today, our Rustic Natural Cedar Adirondack chairs and ottomans are a must-have. They’re generously sized and contoured to provide maximum comfort and feature extra-wide arms that are just perfect for resting a book or beverage. 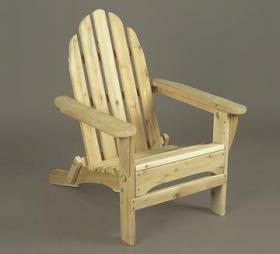 Pair this piece with our versatile and lightweight Adirondack Ottoman and give your legs a treat too. Cedar is naturally resistant to decay, insect, and weather damage and, when left untreated, the creamy natural color weathers gracefully to a silvery grey.